Here's How You Could Win 2 Passes to Gem & Jam 2018! It's already time to start thinking about you 2018 festival season. There's already a lot to look forward to, beginning with Gem & Jam 2018. 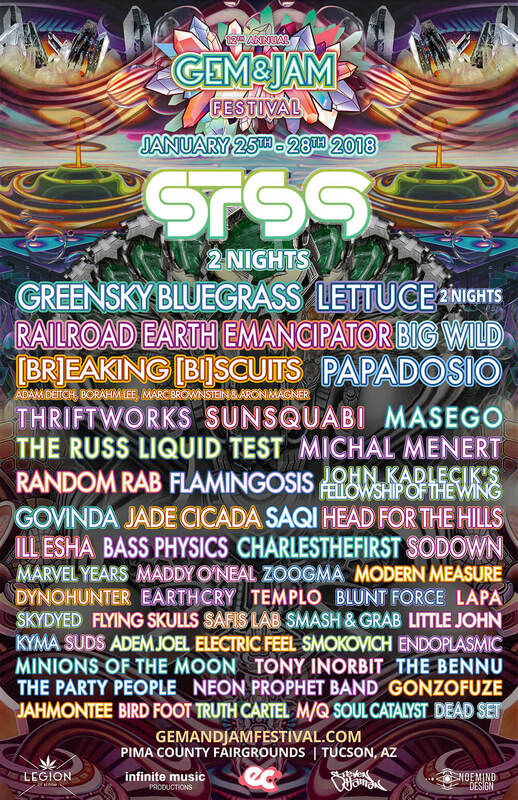 Topping the bill of this Arizona festival is a double dose of STS9, two nights of Lettuce, as well as Greensky Bluegrass, Railroad Earth, Emancipator and Breaking Biscuits (featuring members of the Disco Biscuits and Break Science). Other exciting performances will come courtesy of Random Rab, Thriftworks, and Govinda. With a lineup this stacked, Gem & Jam shows no signs of slowing down attracting some of the biggest talent from the scene. The best part? You and a friend could get into the festival on us. We have partnered with Gem & Jam to give away two (2) passes (to two separate winners), each of which come with a plus-one. Just enter to win before the end of the day on January 2, 2018, and we'll notify the lucky winners of their prize. Emerging from a successful year which saw Gem & Jam embrace the full festival experience with a move from Downtown Tucson to an venue that offered a desert setting with expanded amenities including camping, the twelfth annual event will be a chance for the fest to further spread its wings. Returning to Pima County Fairgrounds for a second straight year from January 25-28, 2018, this might be the best year yet for Gem & Jam!